The rails-to-trails movement—converting unused railroad lines into recreational trails—is “on track” with today’s environmentally-friendly, recycling movement. There are numerous rail trails located in Adams County’s neighboring counties, such as York County’s Heritage Rail Trail and Cumberland County’s Cumberland Valley Rail Trail. Creating bicycle-friendly communities is another movement currently gaining momentum; Gettysburg is joining the ranks of many communities creating bike paths. Again, Pennsylvania is on the forefront of this movement, ranking 12th in the country in terms of towns and cities labeled bicycle-friendly by The League of American Bicyclists. 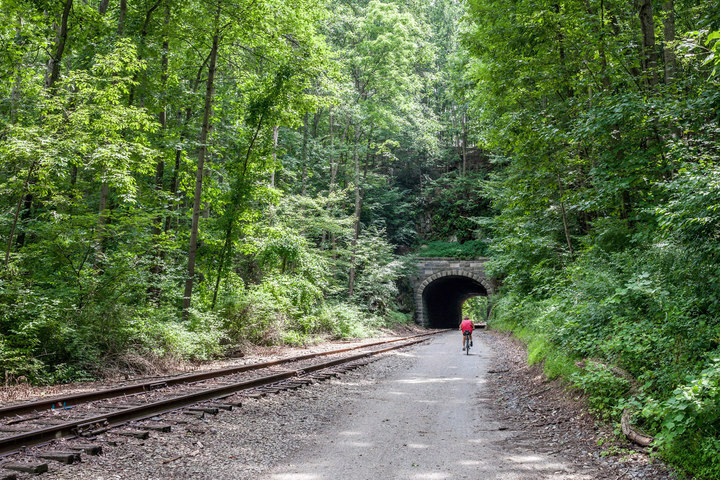 Whether you’re looking for a daytrip getaway, seeking adventure or fitness, or exploring an alternate route in Gettysburg, one of the best things about bike paths and rail trails is that they’re a free way to enjoy the outdoors. Tom Jolin is one of the driving forces behind the creation of Gettysburg’s biking and pedestrian path, serving as volunteer coordinator for the Gettysburg Inner Loop. He says plans for the 5.5-mile pathway are about one-third of the way completed. “The vision for the path is to help people get from virtually any point in Gettysburg,” Jolin explains. The path will form a ring around the center of the town with several spurs going off in different directions. Currently, the path winds along the Rec Park’s Biser Fitness Trail, Lefever Street connecting Lincoln Elementary and Gettysburg Middle Schools, and Old Harrisburg Road linking Gettysburg High School. Grants and donations form the backbone of funding; the Borough of Gettysburg and the nonprofit, all-volunteer organization Healthy Adams Bicycle/Pedestrian, Inc. (HABPI) are organizing efforts. The rails bend gracefully alongside the trail, as York County’s Heritage Rail Trail traverses a 21.5-mile corridor stretching from the Maryland line north into York, connecting several southern York County towns, farmlands, and woodlands, and offering a variety of scenery according to Gwen Loose, executive director of the York County Rail Trail Authority. Numerous points of access include historic Hanover Junction—the location of a restored 1863 train station where President Abraham Lincoln disembarked and changed trains on his way to deliver the Gettysburg Address. Another popular point of interest is the Howard Tunnel, the oldest, continuously operated railroad tunnel in the world, dating back to 1883. The York County Rail Trail Authority was formed in 1990; Loose came on board in 1997 when the trail was halfway developed. She says expansion efforts are still underway today. At least 300,000 visits are made to the trail annually, according to a 2012 study. Loose says local, state, and federal financial support has underwritten the trail’s $3.7 million cost; however, the same study reveals the trail pumps $4.4 million annually into the local economy. A number of businesses located along the trail include Jackson House Bed & Breakfast, New Freedom Rail Trail Café, Four Springs Winery, and the Glen Rock Mill Inn. Farms and grasslands surround the 11-mile Cumberland Valley Rail Trail, linking Shippensburg to Newville, with expansion plans to Carlisle underway. The Cumberland Valley Visitors Bureau recently secured grant funding to add trail signage explaining the area’s agricultural and Civil War history. “It’s a bigger experience when you know the story of the place you’re biking by,” says Kristen Rowe of the Cumberland Area Economic Development Corporation/Cumberland Valley Visitors Bureau. She says the trail is suitable for visitors of all ages and abilities, since it’s fairly flat. It attracts approximately 40,000 people annually, according to the Cumberland Valley Rails-to-Trails Council. Several businesses benefit from close proximity to the trail, including Newville’s Winsome Farms, which leads horseback trail rides, and Merv’s Bike Shop in Shippensburg offering bike rentals.